One of the wonders of the note business is the ability to invest in notes with little or no cash of your own using the partial or tail-end structure. But what happens when a note pays off early? This week’s guest author, Markus Mollica with TimeValue Software, explains how to calculate an early payoff on a partial note purchase using their TValue amortization software. Let’s say that my goal is to build cash flows for future retirement. However, over the next several years, I want to not only build up an annuity of cash flows in future years but to generate cash to purchase notes by selling partials. What often may occur is that some of those notes payoff early which provides a lump sum of cash earlier than expected and can then be used to reinvest in more cash flows. 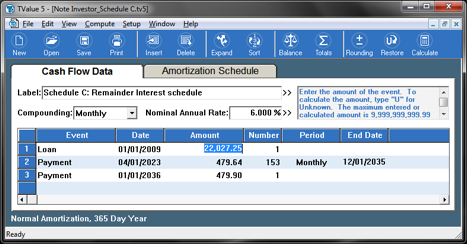 In working through this example I will use the TimeValue Software TValue amortization software to create the amortization schedules, demonstrate how to calculate the investor pay price for the desired yield, and finally determine the early payoff amounts for both the investor and seller. The Event name, Loan, is synonymous with present value (PV) and Pay Price or Investment amount and is always on line one in TValue. For documentation we want to create 3 amortization schedules, the Payer’s schedule (schedule A), the Investor’s Payoff schedule (schedule B), and the Remainder Interest schedule (schedule C). These amortization schedules not only welcome negotiation but provide accurate amounts to be paid out in the event of an early payoff. The Payer’s Payoff schedule is the full balance amortization owed by the borrower or payer of the original note. The Investor’s Payoff schedule is the partial balance amortization owned by the investor who purchases the partial note from me. In other words, this amortization schedule shows how much the investor is due over the life of the note. The Remainder Interest schedule shows the portion of the cash flow that was not sold (also referred to as the tail-end). I purchased a note with a balance of *$76,867.26 at 6% with 27 years of payments left in the amount of $479.64 each month. In TValue software, I can verify the remaining payments by solving for the Number (N) in the creation of the Payer’s Payoff schedule. In TValue, we type the letter “U” (Unknown) for the variable we can want to calculate. One thing to keep in mind is that often times the series of payments in a full note do not amortize out exactly. Essentially, the last payment in the note may be slightly different due to rounding. In TValue there is an option to determine the rounding and sometimes a dialogue window will pop up when the rounding is over a certain amount (~$1.00). Let me demonstrate in this example where I am solving for the number of payments left in this note. In this case, 324 payments amortize the note. However, when I click “Rounding”, I see there is a negligible amount of 26 cents to account for on the last payment. When you select last payment, TValue will adjust the last payment with the Rounding amount. I negotiated a pay price of $46,055.08 for a 12% yield. In the example below, I demonstrate how to calculate my initial pay price. I can perform multiple scenarios to calculate a pay price based on a particular yield, 12% in the case here. I use the following values to illustrate. At the time I purchased the note, I decided to sell a portion of the cash flows. An investor wants to purchase a series of monthly cash flows from me for a 9% yield. We negotiated a pay price of $45,996.61 for 170 payments for his desired 9% yield. This amount is roughly the same amount I paid so it basically cost me nothing and still leaves me with 154 monthly cash flows of $479.64 on the tail-end of the note. In addition to this, I want to create Remainder Interest schedule (Schedule C) of what was not purchased by the investor. The Schedule C cash flows belong to the broker/seller and the schedule is created by calculating the PV on the purchase date or by subtracting schedule B from schedule A ($76,867.26 – $54,840.01= $22,027.25). You may notice a few cents difference in the PV which is due to rounding. The note ends up being paid off early and I (seller/broker) receive cash instead of the 154 remaining cash flows. In this next example I will demonstrate how to determine how much I, the Broker, will receive and how much the investor receives in the event of an early payoff. What Happens When This Note Investment Is Paid Off 5 Years Later? After 5 years, the full balance payoff on the note is $70,217.89. The partial balance payoff for the investor is $40,506.46 (see amortization schedules below). The remaining balance is the difference between the two which is $29,711.43 and goes to the seller/broker (me). It turns out to be a grandiose payout for me with practically no investment up front since I received roughly the same amount from the investor. Schedule A – The Payer’s Payoff amount is $70,217.89 at year 5 on 01/01/2014. 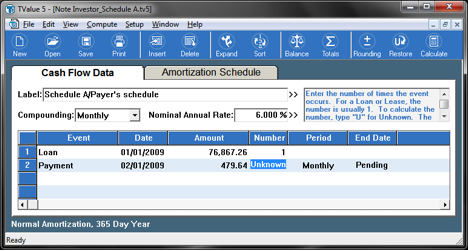 This amount can be pulled off the amortization schedule (as seen below). It would be the same in the case of determining the payoff for the investor in Schedule B. Schedule B – The Investor’s Payoff amount of $40,506.46 is what he receives on 01/01/2014. Schedule C – The Remainder Interest Payoff amount to the seller is $29,711.43 (which in this case is me as the broker since I bought a full from the original note holder and sold a partial to the investor). By doing a present value calculation on the payoff date, you can also get the amount owed to the seller. In reference to the amortization schedules above for early payoff amounts, in the case that irregular payments were made along the way, the payment schedules would need adjusted to accurately reflect the payment amounts and balances. These calculations can also change depending on the terms of the actual partial purchase agreement signed at closing, which varies by investor. 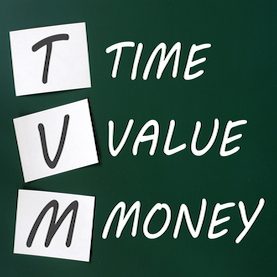 TValue can accommodate any irregular payment amounts made to determine the actual balance at any given point in time. Good luck in your future cash flow deals! Markus has been working at TimeValue Software for 6 years as Business Development Manager, focusing on developing partnerships and affiliate business relationships. He works with note investors who want to capitalize on opportunities to create win-win deals resulting in successful relationships and continuous improvement in their cash flow business. Over the last few years he has provided presentations and training on creative deal structuring and a better understanding of the time value of money. Please feel free to contact Markus Mollica at TimeValue Software with any questions or help using TValue software. Contact information is 800-426-4741 Ext. 212 or mmollica@TimeValue.com. The TValue software is available in the bookstore with special pricing for Note Investors! OUR PRAYERS ARE WITH YOU AND YOUR FAMILIES DURING THESE HARD TIMES. WE HOPE YOU MADE OUT WELL DURING THE HURRYCANE HARVEY. Thanks Richard for your concern. We are based out of Florida so had the Hurricane Irma scare. We were some of the fortunate ones this time around with minimal damage. I feel for everyone impacted, both here in Florida with Irma and in Houston with Harvey. It sure puts things in perspective. Can you tell me about the prices in the 2000+ recession and the real Estate foreclosures and if most investors came out with little loss? Can you tell about insurance and tax issues and if I collect those and then pay them out or does the owner cover these cost? Will I get a notification if the owner does not pay the taxes on the property?